My heart pounded rapidly and my lungs were ready to burst; my sleep was interrupted abruptly. Tears formed in my eyes as a feeling of dread settled upon my heart. I sat straight up wide eyed wondering at the reality of what had just happen. Fear and confusion filled the atmosphere. Startled and dazed, I tried to clear my thoughts. After regaining my bearings, I realized that I was in safe in my bed. I had experienced a prophetic dream that was so real, I can see the images as clearly now as when they first happened. For days the dream was on the forefront of my thoughts. I began praying to find the meaning that God wanted me to comprehend from it. Let me share the dream with you. A small Ugandan village settled in the bush was quiet except for the noise of children at play behind the house. There was a very simple main house with a boy’s quarter behind the house. The boy’s quarters was a long rectangular building divided into 4 single rooms, each with one window and one door opening in the same direction which was towards the back of the house. I was engaged in laughter and conversation with a small group of friends. We were all sitting under the shade of a large flowering tree which grew in the middle of the front yard. Out of the corner of my eye, I spotted several lions lazily coming out of a wooded area across the dusty, dirt road. The lions fixed their stare upon us, as we quickly rose from our seats and ran to the back of the house to alert the children of the danger and usher them into safety. We feared that the lions would follow us to the back. The team gave it their all and worked together to get the children into the house. We were just seconds ahead of the lions. It was as if they had been delayed supernaturally. The hot breath of the angry, hungry cats was felt as the lions were being kept from entering and the door was closed. The first scene was gone and now before me was a completely new setting. I was leaning out the window of a third story building straining my eyes and ears to keep connected with my husband and Ugandan friends for as long as possible. The figures were growing smaller with each step. They were walking away from me at a steady pace trying to get through this dangerous and overgrown busy area quickly. Even though I walk through the valley of the shadow of death, I will fear no evil. The thick trees obscured my vision of them, and I struggled to locate them again when they came out of the bush into a clearing. I gasped in horror when I saw the hazy form of three male lions approaching out of the shadows of the trees. Fear gripped my heart as I called out to Bill but my cry were unheard by his ears. The lion that appeared to be the leader was gigantic, almost twice the size of the other two. Although I could see the lions from my vantage point, it did not appear that the team below had seen them. 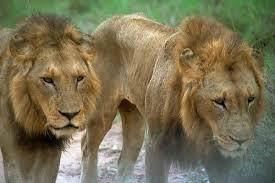 The lions successfully reached their intended victims within seconds, and had the added element of surprise. Two of the lions watched as the enormous lion rose up on his hind legs. He roared, bore his large teeth, and was coming down with tremendous weight on my husband. My heart began to palpitate and it was then that ... I woke up! I have been seeking the Lord as to the meaning of these dreams. I have found that when seeking God for answers, He uses so many ways to talk to me. I was looking at books to add to my Kindle, when I came across one called “The Path”. In my spirit I knew that it was significant for me in this season. The Lord has me in a quiet season, alone with Him, where He can talk to me. Immediately after downloading the book, I began to read. I was about half way through when lion attacks were described and how they relate to those who are seeking God’s kingdom and His righteousness with all of their hearts. The following words are a paraphrase of Rick Joyner’s penned words. “The timing and manner of the enemy’s attack is important to understand. It is the lion’s nature to hide and stalk until there is an opening. For lions to brazenly attack you in a group like this one did is a sign of desperation. This is a good thing. They are threatened by you, as they should be. It was desperate, and it was desperate because what you were doing was such a threat. The three things you were doing are the greatest threats to the enemy, and they are like the chord of three strands that can bind you together so that your unity cannot be broken: 1) Knowing the voice of the Lord 2) Obeying Him 3) Dwelling in His presence. Resolve each day to get to know His voice better, to do His will, and to abide in Him. These will keep you, and they will lead you to the kingdom. You must deal with the attacks, but do not let them sidetrack you. Even if lions cannot devour you, then they still win if they can turn you from something important that you’re engaged in. For them to have attacked when you were in a group and so brazenly, you were doing something crucial. Every day on the path of His presence you are in danger of being killed. The enemy is constantly prowling around you seeking someone to devour. You have to learn this, or you will not make it. You are in the will of the Lord, and there is no safer place than being in His will. The Lion who is with you is much greater than those who are seeking to devour you. You must see the Lion who is in you, and you must, above all things, follow Him. You must not fear the lions that are seeking to destroy you, but you must resolve to make them fear you because of the One you abide in. That is the only safe place you can be. Pastor Bill and I want you to know how very much we appreciate you prayer for us on a daily basis. We have come to accept that our lives and ministry will always be a target of attack. The Lord has spoken that on this earth, we would be walking among the champions of heaven; people who would not be noticed by man but have already captured the attention of heaven. We have waited a long time for Him to bring these godly leaders into position. This past two year the Lord Himself has been making changes to “Prepare the Way Ministry”. He is the only one who can look into each heart and judge rightly. He has emphasized to us that He wants this ministry to be completely pure and completely His. We have patiently waited upon Him and have watched as He brought His structure; including buildings, staffing, and positions into place. It has not been easy or without criticism; but we know that our calling has been given to us by the King, Himself. We live each day to know His voice, obey Him, and dwell in His presence. We know that God has put us together with you to help bring His kingdom to the ends of the earth, and take part in the harvest of the ages. What a privilege you have to be alive in this generation. Your faithful intercession prepares the way for those on the frontlines to carry the authority of the King to open nations to the gospel, silences lying voices, and thwarts the destructive plans of the enemy. We depend upon you to be at your vantage point, as watchmen on the walls, alerting the others to what you see lurking in the darkness of night. Intercession sees the plots of the enemy and stops them. Thank you for taking your position seriously. God may wake you up in the middle of the night to pray for Prepare the Way Ministry. The sacrifice you make for the Lord will not go unnoticed or unrewarded. The path that you have chosen is a high calling. We ask you to continue to pray for us. Please contact us if God puts something upon your hearts for us. We would like to introduce Jennifer Reitsma. She has faithfully ministered in Uganda with Prepare the Way under Living Word Christian Center for several years. She will be sending the future “Prepare the Way Ministry Prayer Shields” to you. Please feel free to contact either Jennifer or us to share what God has put on your hearts for Prepare the Way Ministry.